Two miniatures united in an unusual composition on an illuminated leaf from Gratian's Decretum, the most important legal text of medieval Europe. Two miniatures on one leaf. Ink, tempera, and gold leaf on vellum. This striking composition comes from a copy of the Decretum Gratiani, the most frequently illuminated legal text of medieval Europe. Composed around 1140, it constitutes the most important foundation for Roman Catholic church law. The present leaf opens Causa II, illustrating a lawsuit against a bishop accused of fornication with a married woman, depicted in the right-column miniature. We encounter the judge, who is represented by a pope clad in red, as well as three witnesses, and the culprit, the latter squeezed to the miniature's right margin lifting his hand in defence. The tall St. Christopher with the Christ Child is quite perplexing and most likely by the same hand as the small miniature. Perhaps introduced as a monumental filler for the half-empty column, he also represents the lost soul who had served the devil before he was converted to Christianity. Interestingly, the leaf's secondary decoration recalls Italian style thus an Italian artist may have collaborated in the project. On the other hand, the combination of Italianate and French styles is quite common in Southern France in the late 13th and early 14th centuries. 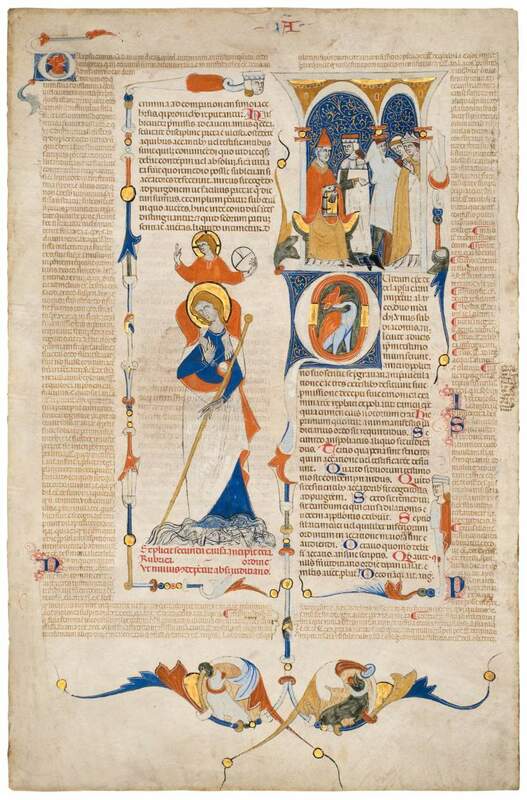 Originally most legal manuscripts were supposed to be manufactured in Bologna, thus artists in Avignon, Toulouse, and Montpellier copied and emulated those works.